Although this page refers specifically to NCC series controllers, the principles apply to several other controllers of our manufacture as most employ very similar circuitry. The principal exception is the 4QD series. If you attempt to fix a controller yourself, you may end up increasing the damage. You will certainly remove any possible diagnostic clues which could aid us in repairing the controller or in finding the cause of the failure. This causes a significant increase in the work involved in diagnosing the fault and repairing the controller. Controllers where repairs have been unsuccessfully started are therefore not covered by any standard offer of warranty or repair. To test out the controller properly, the minimum equipment you will need is an oscilloscope and a suitable power supply. Testing damaged controllers from a battery is not advised_ there is just too much chance of extending the amount of damage. The controller without a motor connected draws about 30mA from the power supply with no relays energised. See page on operating voltages for relay current draw. The MOSFETs do all the work therefore it is these which are involved in most of the failures. However a MOSFET failing does tend to lead to a chain reaction and the drive circuitry is usually damaged also. 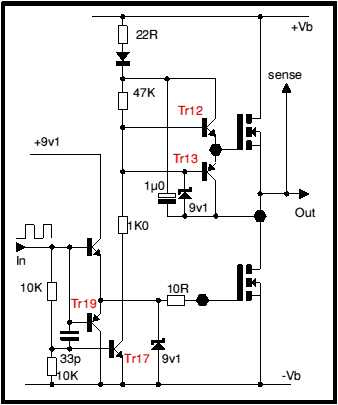 This page describes how to test the drive circuitry in the absence of the MOSFETs. Only once the drive circuitry is tested can the MOSFETs be refitted safely. The pwm signal from the modulator feeds a complementary emitter follower, Tr18 and Tr19 which provide current gain to drive the MOSFETs. There is a 9.1v zener connected from their emitter to the 0v line. This has two functions: one is to help protect the MOSFET from transient voltage spikes (usually generated by noisy motors). The second is to help protect the drivers and the rest of the circuitry in the event of a MOSFET failure. As such, it is ‘sacrificial’ and must be tested! The low side gates are driven by 10 ohm resistors: these are also sacrificial as when MOSFETs fail, they often go through a stage where drain and gate are shorted – this feeds back current into the control circuitry. The CR16 size 10 ohm resistors usually fail open-circuit whereas larger CR25 size resistors can burn, even sometimes damaging the circuit board. CR16 resistors give significant protection – though this is not 100%! If a MOSFET fails, always measure the gate resistor with an ohmmeter – the gate resistors can go to a high resistance which will prevent proper operation. The PWM from the modulator also feeds Tr17: this is the high side switch. There is a capacitor present to speed up its switching so that the high side is allowed to switch on (Tr17 off) only when the low side drive is off. The high side gate drive is via a ‘bootstrap’ pump. When the low side MOSFET turns on the 1µ0 capacitor charges up to full battery voltage via the 22R and the diode. When the low side MOSFET turns off, the motor current commutates through the hiside MOSFET which goes into conduction as a forward biased diode so its source rises to slightly more than the battery voltage. The top of the 1µ0 capacitor rises to twice the battery voltage. Since TR17 is off, current flows through the 47K switching on the complimentary emitter followers Tr12 1n3 Tr13. The hiside MOSFET switches on. The gate drive voltage to the high side MOSFETs is limited as the base of Tr 12 and 13 is clamped by a 9v1 zener to the source of the high side MOSFET. The terminal marked ‘Out’ feeds the motor negative – motor positive is to battery positive. Also fed from the ‘Out’ terminal are two sensing circuits: one refreshes the ignition circuity so it remains on until the controller has stopped switching. The second feeds the high side and low side current limit circuits. When a MOSFET fails, a chain reaction can occur. There are several MOSFET failure causes and the events are fast and very difficult to properly diagnose, so it is usually difficult to guess at the causal event. So it is sensible to remove all MOSFETs from circuit and test the drive circuitry. On NCC-60 and NCC-70 you will also have to remove the main capacitor. On NCC-35, it can remain. MOSFETs can be tested out of circuit, see MOSFET testing. Inspect the drive components associated with any failed components. Replace any visibly damaged components. Other components values are marked on the circuit and type used is not critical. If replacing the drivers with other types, choose a driver type something which can handle several hundred milliamps. The circuit will work with common transistors such as BC 547 and BC 557 but this results in slightly inferior drive waveforms. Other components are less likely to be affected. These tests will work with or without the main capacitor – you do not have to refit this until after the MOSFETs have been fitted but you must refit it before doing power tests or you will damage the MOSFETs! To test, connect a resistor between Out and -Vb (Battery -ve, 0v). We use a 68 Ohm 3 watt. It is permissible to simply short these two points out – but a resistor is better. If the 68R resistor is too high, then the low side current limit circuitry will cut in and the modulation will not be variable but will be restricted to a short ‘on’ pulse of a few µ seconds. The exact value of resistor at which this occurs depends on the supply voltage but this is the way of checking the current limit! If you do not use a load like this, the low side waveform is unaffected, except that the current limit engages, but the high side waveform is essentially meaningless. the expected waveforms are as the drawing. This was drawn by tracing over a photograph so is idealised but is true to life. The waveforms are shown in red with the oscilloscope graticule on black. Green vertical lines have been drawn to show the relative timings of the two waveforms. However – the timing components are never damaged by MOSFET failure and there is virtually no chance of the timings being upset if all semiconductors are correct. Waveforms shown are for an NCC. VTX waveforms are very similar but the hiside amplitude is nearer to 12v than to the 9v shown. The waveforms above are at 50% modulation: they should vary between 0% and 100% as the pot is moved. Amplitude of both is about 8v peak to peak: the circuits both run from 9.1v and the emitter followers cannot pull the gates to closer than 1 Vbe from the supply rails. If the load resistor discussed above is absent or is too high a value, the low side waveform is a short positive pulse and the hiside an even shorter negative pulse. On the high side a slowing of the rising edge (positive-going) of the waveform. On the low side: the negative level rises slightly as the capacitor stores a charge which the emitter follower cannot remove. Generally these will be a slight rounding of waveform corners. Once these waveforms are correct, you can fit new MOSFETs – or the old ones if still working – and test with no motor connected. However, do not mix different MOSFETs! It is permissible to have Drive MOSFETs different to Regen MOSFETs, but they should always be matched within drive (loside) or regen (hiside). With the MOSFETs fitted, the output waveform should be a good squarewave – though if the main capacitor is out of circuit there is very heavy ringing on the positive of the squarewave. Once Once you have seen this, refit the main capacitor. It is probably useful to check controllers no-load current consumption: this will be around 35mA at zero speed, will rise to around 100mA as the relay clicks in (this for the 24v version) then will rise only slightly, reaching maybe 130mA at just below full speed. It drops slightly as switching stops and full speed is reached. The circuit is pretty much self compensating so almost any MOSFETs with suitable current and voltage specifications can be used. The following is a list of some of the types we have used. Always use the same current rated and Rds(on) rated MOSFETs for both hiside and loside. Some of the MOSFETs used in earlier controllers are listed below, more recent are listed on the separate page linked to below. These are detailed on a separate page. This page is not intended to be a definitive guide to fault finding, but an aid to those discussing servicing with 4QD Support. So, if you have need of this page and are not already in touch, contact Support at 4qd.co.uk for help. PWM motor speed control how it works. Earth Track Fuse and Earth Loops What Does a Motor Speed Controller Do?